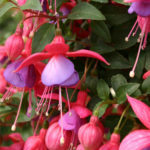 Gardening NewsHome » News & Posts » News & Posts » New Fuchsias for 2016! We have several Fuchsias that are new to Babyplants for Spring 2016. 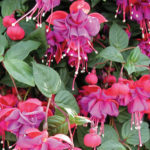 Jack Shahan is a trailing fuchsia with pink sepals and a pink single corolla. Jack Shahan has been awarded the Royal Horticultural Society’s Award of Garden Merit. Red Sunrise is a trailing fuchsia with red sepals and a purple single corolla on a backdrop of yellow/green leaves with red veins. Great for adding interest to mixed hanging baskets or containers. 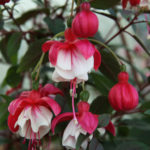 Alwin is a trailing fuchsia with stunning pink sepals and a double corolla which is white with pink veins. Great for planting in mixed baskets or plant 5 in a 12”/30cm hanging basket to create an amazing display. Dark Eyes is a trailing fuchsia with pink sepals and a purple double corolla. Dark Eyes has been awarded the Royal Horticultural Society’s Award of Garden Merit. 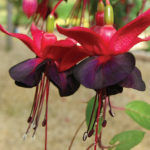 Maxima is a trailing fuchsia with red sepals and a deep purple double corolla. Plant 5 in a 12”/30cm hanging basket for a stunning display. Ringwood Market is a trailing fuchsia with cerise sepals and a lilac double corolla. Great in mixed hanging baskets. 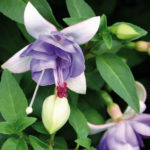 Moody Blues is an upright fuchsia with white sepals and a blue/lilac corolla. Perfect as a centrepiece for mixed hanging baskets. 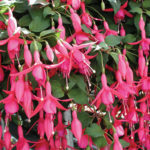 Browse the full range of Fuchsias here. Available to pre order now for Spring delivery. Fuchias – New for 2014! Mini Famous® Double Dark Red – New for 2014! Geraniums – New for 2014! previous post: 10 Brand New Varieties for 2016! 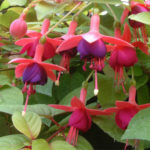 Home » News & Posts » News & Posts » New Fuchsias for 2016!